With our monitor lease program, you're not just our customer. You're an affiliate. Premium support for you and your business. We want your radon inspection business to thrive. So we're here for you at every step. Our monitor lease program includes full-service equipment maintenance, as well as support for every issue or question you may have. If your state requires licensing and special reporting, we can take care of that as well. With everything from audit support to your technician license management, we are your partner in the radon testing business. We handle the test data and prepare every report. * 1-hour turnaround during normal business hours. High volume times may take up to 2 hours. Our lease program can adjust with you seasonally. With all of the benefits mentioned above, we have created a month-to-month program that allows you to customize the number of monitors you have on-hand, to adjust with client demand. 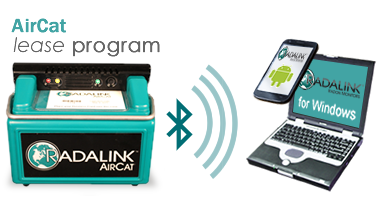 The AirCat lease program boasts the technology and convenience of our newest state-of-the-art radon monitor. This Bluetooth-enabled monitor allows you to upload test data directly from your Android™ or Windows® device. With the AirCat lease program, you get an unlimited number of reports processed for a fixed low monthly rate.